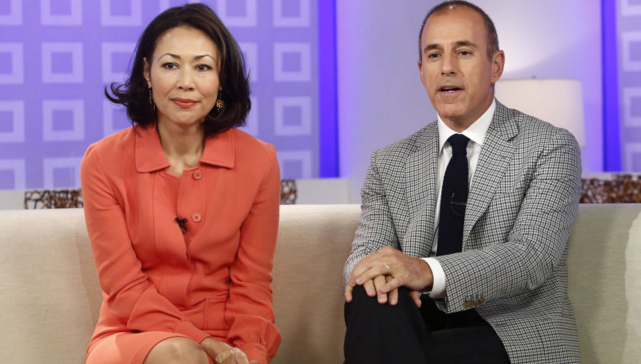 Curry was herself fired from “Today” in 2012, a year after she was promoted from news anchor to the couch with Lauer. Curry had worked with Lauer for more than a decade. Her tearful final appearance on the show led to sympathy for her and hostility toward Lauer. According to CNN, many of Curry’s fans believe that Lauer was behind her ouster, a theory that was supported by Brian Stelter’s 2013 book “Top of the Morning: Inside the Cutthroat World of Morning TV.” The book described “Operation Bambi,” an effort within NBC to force Curry off the show. Lauer was said to dislike working with her and made that known when he was negotiating his new contract. “Harassment and abuse is always about power … don’t forget what Matt Lauer did to Ann Curry,” Alexis King tweeted on Wednesday. Some have even called for NBC to bring back Curry, who is now executive producer and host of a new docuseries, “We’ll Meet Again,” which will premiere next year on PBS. In an interview with **People** magazine — previously scheduled to promote her new show — Curry said of Lauer’s sudden departure, “I’m still really processing it,” and declined to comment further. Curry has been a reporter for more than 30 years, including stints with the NBC affiliates in Medford and Portland, Ore., and, from 1984 to 1990, the CBS affiliate in Los Angeles, where she received two Emmy Awards. She joined NBC News in 1990, serving as Chicago correspondent and anchor of “NBC News at Sunrise” before becoming news anchor at “Today” in 1997. She also co-anchored and anchored “Dateline NBC” from 2005 to 2007 and was the primary substitute anchor on “NBC Nightly News” from 2005 to 2011. After leaving “Today,” Curry was a producer and reporter for “NBC Nightly News,” “Dateline NBC,” “Rock Center,” and MSNBC. Her first post-departure appearance with Lauer, during coverage of the 2012 Olympics in London, was described as “tense,” “awkward” and “chilly.” She left the network in 2015. Curry covered such stories as the Southeast Asian tsunami and the U.S. invasions of Afghanistan and Iraq. She has also filed stories from such places as Sri Lanka, Democratic Republic of Congo, Rwanda, Albania, Iran and Darfur. To see a trailer for Curry’s new show, click here.